Kreative Kristie: Stamp of Approval Beautiful World Collection Blog Hop! Stamp of Approval Beautiful World Collection Blog Hop! Hi everyone! I am so excited to be participating in a blog hop celebrating the release of the Stamp of Approval Beautiful World Collection. Today myself and many of my favorite designers are sharing cards using the Beautiful World collection. The box goes up for sale tomorrow at 10am. StampNation members get the sales link one hour earlier at 9am EST! The box contains products that can be used together to create many different cards. They can also be used along with products you already have in your supplies! Awesome!! I have been creating with the Beautiful World Collection for a few weeks now and still haven't used all of the supplies in the box. I started by stamping the gorgeous image from Beautiful World by Gina K, 3 times down the side of my card stock using versamark ink. I then added white embossing powder and heat set it. I then blended my distress inks to create a rainbow. I fussy cut it out and popped it up on my white card base. I absolutely LOVE the font on this sentiment and the other sentiment in this set called Enchanted Garden by SugarPea. Make sure to leave a comment on each stop along the hop. TWO lucky commenters will win a Stamp of Approval box. The more times you comment, the more chances you will have to win! You've got until Thursday at 9:00AM EST to get those comments in. The winner will be announced on Catherine Pooler's blog! Good luck and happy hopping! Love your cards! Great ideas with the collection. Beautiful cards. Loving this stamp set. I just love the rainbow card Kristie! I can't wait to try this with the new stamps. Beautiful! There rainbow border card is absolutely stunning! Kristie, your first card is amazing. I love the border you made!! I really like both of your cards, really like the rainbow, thinking of all the choices of colors for that one. Great designed cards did you make! Specially love the flowerd one! FABULOUS! Love all of your beautiful designs and gorgeous colors. Everything POPS!!! Love your cards. that first one is just stunning - love a rainbow. Love your cards! Hoping i win this kit! Love the fussy cut card! also really enjoy the color combo in the second card! I love both of your cards! They are beautiful and so is this collection!!! Both cards are gorgeous!!! I love the resist in the bright array of colors! Just a beautiful card. Love that stamp set. All the cards are so pretty can't wait. BEAUTIFUL cards, especially the first card, so stunning. Both cards are gorgeous, but I am a sucker for rainbows! Too cute, I never think to create the look of patterned paper! Oooo! Love both of these cards! They're so bright and cheerful! Super SOA inspiration from all of you guys! Your cards are absolutely stunning Kristie! Stunning Cards Kristie.....as always...teehee I would love to WIN one, because our exchange rate is horrible, and it doubles the cost for me. boohoo TFS with us. WOW!!! I keep saying that but it is true I am really excited about this SOA collection! oooooohhhh! love your card projects!!! So pretty. Love both of your cards Kristie. Awesome cards, Kristie, you always inspire!! Great cards ! I love them both, but I really like what you did with the first one and the rainbow border. So clever! I am loving the Gina K stamp set and you have made a lovely card with it. Love the simplicity of this card! Of course I love all your cards! Wonderful cards Kristie. That first one is big WOW! I love the colors of the first card, so cheery and the second one is so clean and simple. Just right. So pretty, Kristie. Every time I see one of your cards from this collection I think it's my favorite, then along comes another gorgeous creation. Love the Gina K image! I love the Beautiful World set and fussy cutting it really popped it out. Both of these cards are gorgeous, but I am partial to the rainbow sponging over the heat embossed image. Beautiful cards! I really love how you created a custom boarder on your first card. Both cards are beautiful. Love the way you fussy cut out the swirls and attached them on your first card. Thanks for sharing your ideas with us. Those are just fabulous! I love the rainbow colors and the way you trimmed out the first one, and the second one is such a clever clean & simple card. Very pretty! Love how modern they look. I love your rainbow colored card, but the second card just rocks. It's funny, I would probably never use those colors, but I really love them on your card. Cutting out the stamped image from the first card real makes it pop! Great job!!! Your cards are so beautiful! I especially love the first one--so pretty! Lovely cards Kristie. Great colors! Love, love these cards! I'm so excited! I can hardly wait to get my hands on this collection! Both cards are beautiful. But I really loved the rainbow border card. Your cards are stunning. Loving these stamps! These designs have a bohemian or some kind of vibe that is just me. Yes, I have to have the SOA this time. Love the white embossing on the bright colors. Absolutely wonderful examples for this awesome kit! Can't wait! I love your cards! Can't wait to try these out! The rainbow card is my favorite! Love the bright cheery colors. Thanks for sharing. Your first card is just stunning. Love love love the colours. Love both of them. Beautiful! I love the background you created and the color matching. Beautiful work,Kristie! I just love seeing the different backgrounds you create with small stamps. It always inspires me. Love the colorful border on the first card! Thank you for sharing your lovely cards and for the wonderful inspiration! Beautiful cards. Stunning colours and designs. Love the new SOA! The stamps seem to be exactly what my collection is currently lacking. How did you know? I can't wait to get this collection! Gorgeous cards. Love the colors and designs. Love the cards! I really like the rainbow effect, and the colors for the second card. Can't wait for the kit. WoOW! Kristie, they are gorgeous! Love the first card, just stunning with that border. I am crossing my firmgers to win a box of this SOA :) Thank You sooo much! Love your card Kristie, it's gorgeous. So beautiful card. Love using the distress inks. I can't wait for this collection! love the inspiration!! Wow Kristie! Both of your cards are so pretty - I especially love that first one! Such bright fun colors. Love the cards, especially the first one! This kit looks exciting. So pretty! Can't wait to play! I am in awe, Kristie! These are insanely gorgeous! I absolutely love them both!!! Thanks for sharing them. Wow, love your card, so fresh and gorgeous! love the fussy cut distressed border on the first card....and those flowers on the second just make me HAPPY! Kristie your cards are gorgeous. Love the rainbow colors. You can never go wrong with rainbow. The sugar pea set is just darling. Your card is so bright and cheerful. This cards are really beautiful. I especially love the rainbow one. Your cards are so beautiful. Was it difficult to fussy cut the rainbow embossed section of the first card? Love the way you did them, the colors are great!. Both cards are beautiful but that first one is extremely striking! Both of these cards are beautiful. Love everything Gina K. Thanks for sharing! I just love the first card and how vibrant the colors are! Your cards are stunning! Love the colors! gorgeous! Love the way you cut out the design on the first card. Wow! Two beautiful cards! Thank you. Love, love, love the colors! Beautiful. Love your cards and this collection!!! The both cards are beautiful. Thanks for sharing. Love your first card, the colors are beautiful! Oh my goodness these are stunning Kristie!!! Your blending is amazing!! Oh, I love them. Clean and simple, yet so elegant. Both cards are beautiful, but I think the second one is my favorite. Both are so very beautiful! I especially love the array of colors on the first one. AWESOME cards!!! Loving the rainbow one, Soooo Gorgeous!!! It is amazing the ideas you come up with. All I can say is WOW! Your cards are both gorgeous! Kristie, both of your cards are gorgeous, but I especially love the background you've created on card 2, that's so lovely and perfect! The colors, the placement... Perfection. The colour combinations are so bright and just sing of spring and summer! Especially love the blended colors on your first card. Very nice job on both! Both cards are beautiful. I love the sentiment. You are a master with color! So pretty! I love both cards. Thanks. Wow - what gorgeous cards! Love the colors and stamp combinations. Love your choice of colors. Beautiful!!!! The first card is gorgeous with the blend of colors. The other one is nice too. Gorgeous cards! 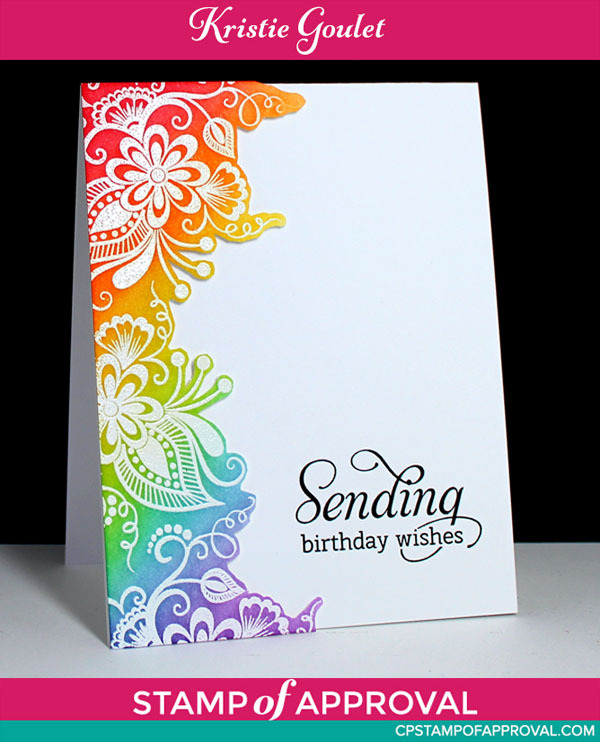 Love the beautiful rainbow colors on the first card with that awesome embossed design! Wow you have been busy. Hey are so beautiful and so different. Such great ideas. Your cards are awesome. Love the colors on the first one. Your cards are absolutely lovely. Thanks for sharing. Love the bright and inviting colors on both of your cards. They are awesome. Kristie, you're style is so clean and beautiful. Your cards are gorgeous!! Absolutely love these amazing cards and beautiful color combinations! Thank you for the inspiration! Two gorgeous cards. I like the colors and design. BOTH cards are amazing. I love the line art florals on the second card - so many possibilities. The coloring on the first card is stunning! Thanks for the opportunity to win THIS kit! Love both cards. 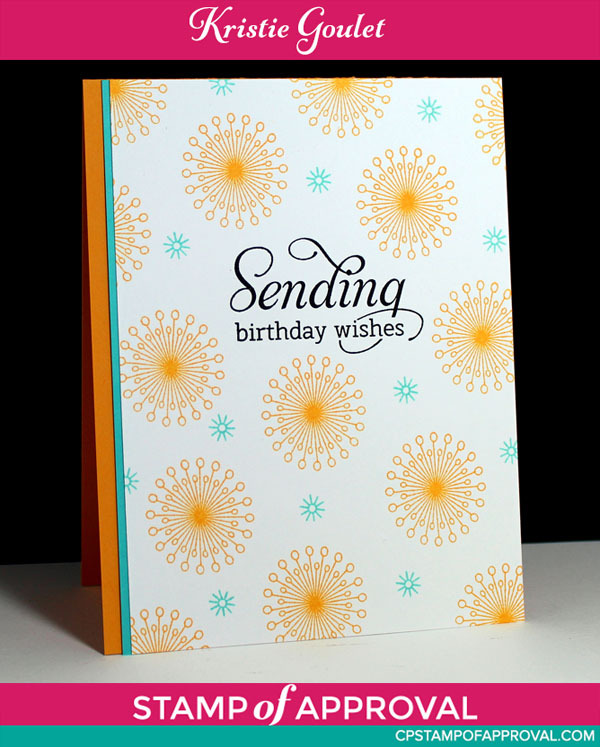 I really like how you stamped and cut out the flourish to make a simple card on the first card. The second card is simple and so bright, love the color choices. What a clever idea this stamp corner took on a whole new look. Great job! What wonderful ideas for the lovely scroll stamp! NIce first card. Love a rainbow and the fussy cutting! What beautiful cards! That first stamp is stunning and what a fabulous way to use it! Love the clean design of your second card too. So pretty. Kristie, I'm loving your amazing cards! I have to say the first one is my fav! I LOVE your card! Using the flower and scroll and rainbow colors made an amazing card. Both are beautiful cards, but my favorite is the top one! Oh I am itching to case it. Have to be patient. :-) Thanks for sharing! Both cards are lovely...they have a clean look with just the right amount of color. WOW! These are great!! I love the colors you used - thanks for the inspiration! Kristie, I love both of your cards. The Beautiful colors and embossing you did really makes the cards pop. What a GREAT SOA this collection is! I like the second card more than the first. Both are very pretty. Cool cards! I love the way you did a border on the first one. Thank you for sharing the technique, I cannot wait to copy both of these cards...so beautiful. Wow, beautiful! Love both of those card ideas!! I just love your colors!!! I love these cards. The colors are so vivid and happy. You not only did one card but two very different but really nice ones. I love both of them. Great works of art. Love the rainbow colors! Cute cards! Beautiful cards. Love the colors and layouts. Can hardly wait to get my hands on my SOA box. Beautiful!! I'm envisioning a collection of note cards with that second card and a variety of color combos. Thanks for the inspiration! These are both outstandingly beautiful. I'm new to the Wait List so I'm very excited at the possibility of winning! Especially love the first card! Different designs, same sentiment - love the diversity! Love the happy bright colors on both cards. Fabulous! Hi! Your first card is beautiful. I like how you created 2 completely different cards with same sentiment. The second one is more basic, but quite lovely. Thank you for sharing. Beautiful. The rainbow is my favorite. Your second card, made me smile!! Love the colors!! Both are beautiful! Totally Fabulous cards! I'm really liking the first one, the colors are great, and I really like how you fussy cut the flourishes to give it more dimension! I love your cards! They are amazing! Great cards. What versatility with this collection! Love both cards and the clean look of them both, you did a great job!! What?! No black strip? Gasp! wow, what a great cards! The rainbow inking over those images is gorgeous, Kristie. I love stamped patterned paper and yours is lovely. Both cards a just beautiful. The rainbow card is so pretty! I can't wait to get this collection in my hot little hands. Beautiful cards! Love your colors. Love it. Card makes you feel good and happy!